In the previous entries on pen history, the British manufacturers played a dominant role in the steel pen industry. Up through the 1830’s the Americans were minor players in many things, not just making steel pens. and Frederick Douglass publishes Narrative of the Life of Frederick Douglass, an American Slave. The 1840’s saw a young country begin to grow into its power and geographic size. It saw the first travelers cross the Oregon trail, the evocation of Manifest Destiny, and the war with Mexico. The first adhesive postage stamp, the discovery of gold in California, and the invention of the first sewing machine by Elias Howe also show the inventiveness, energy and potential of this new nation. By 1850 multiple makers competed in a very new, extremely rapidly growing market. 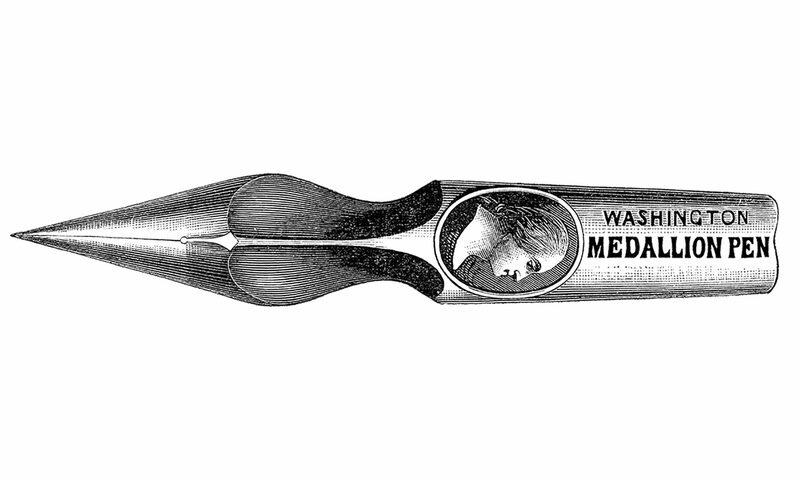 The 1840’s also saw a mini-explosion of new American steel pen manufacturers and sellers, as the techniques from Birmingham made their way across the Atlantic, machinery and tool making expertise was refined and began to spread outside the major industrial centers, and the demand for steel pens (predominantly British) began to rise at the same time as nativist feelings towards “buying american” rose as well. Charles Atwood moves on to other pursuits after 1840, but several other new-comers step in to fill the void. Some are short-lived, like Mark Levy, some keep going for over a decade (Myer Phineas). We have stationers who make pens, like Mark Levy and Myer Phineas, as well as inventors, artists and industrialists like C. C. Wright and Jodiah Hayden. We also have a rather strange anomoly, an American-based maker of British pens (Herts & Sons). Instead of trying to write a single, very long post to cover everything, I’ll break up these makers into individual posts so as to be able to deal with them as best I can. I’ll ensure this list is turned into a list of links as these posts go up, so if you want to find one of them, you can get there from here.